MILLING QUALITY IS king when it comes to oat. 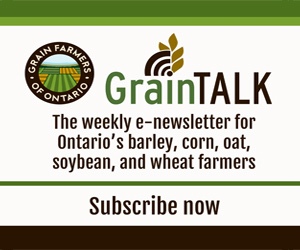 While farmers look for disease resistance, standability, and big yields, Agriculture and Agri-Food Canada’s (AAFC’s) oat breeder Weikai Yan has to first ensure a new line of oat produces the plump, white, high beta-glucan grain that end-users demand. Finding that balance is a challenge — oat is a food crop first, and carries a health claim which relates to the level of beta-glucan in the seed (it must be higher than 4%). What’s more, oil content must be below a certain threshold, and end-users need grain with a high groat yield once de-hulled. That’s a long list of demands when you also need to make sure the crop resists rust, both crown and stripe types, stands well, and yields big bushels. The challenges oat growers face really depend on where they live. Yan says that Ottawa’s Central Experimental Farm marks a decent half way point for where the main yield drags diverge. For southern Ontario, biotic stresses (disease) will be the most limiting factor. For eastern Ontario, much like parts of the Prairies and Quebec, it’s abiotic stresses (growing conditions, frost-free periods, etc.) that hold back yield. For that reason, Yan’s program breeds and tests lines not just for conditions at Ottawa or insouthwestern Ontario, but also collaborates with western Canadian and Quebec counterparts. Oat isn’t a high acreage crop, even though it is certainly one that has been grown for many years in Canada. There’s still an agronomy research and extension gap with this crop — a gap that’s been creating some frustration for end-users. Rust pressure has farmers working hard to protect the crop with fungicides, but a double application can keep the crop green a long time, meaning some farmers are choosing to dry down the crop with a pre-harvest application of glyphosate. The trouble there is that oat buyers don’t necessarily accept a crop treated with glyphosate, depending on what market the grain is destined for. There is a disconnect, at least one end-user says, between the demands of the end-user and the agronomic best management practices on the farm. Recent successes out of the Ag Canada program certainly shows promise — Quaker Oats has typically used the Dieter line for up to 40% of its processing in Canada. But AAC Nicolas is making waves with end-users, Quaker included, Yan says, and the variety offers a pleasing yield bump, too. A 20% yield increase with a better quality profile makes AAC Nicolas almost perfect, Yan says, though the kernel size could be slightly larger. “It is going to be very tough to top Nicolas,” Yan says.